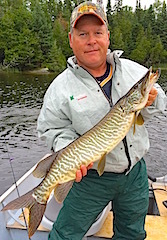 Weather this week was cold & rainy but our guests persevered through it & caught plenty of fish. consecutive year. DOA they went out & caught 16 Northern Pike by suppertime. 1st full day they did great catching 37 Pike & each landed a 19�?� Trophy Smallmouth Bass. 2nd day they caught 18 Northern Pike a few SB. 3rd day had Mike having the hot hand landing 15 Pike himself including a 34.5�?�er. 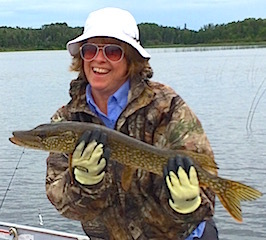 4th day was a dynamite Northern Pike day as they landed over 38 between 30-38�?� & Jennie lost a brand new X-Rap after hooking into a monster fish that spooled a full reel of braided line. 5th day was another good Pike fishing day catching 17 Northern Pike in the 28 to 32 inch class. 6th day they had a fabulous day Muskie fishing Mike catching 1 with Jennie being hot catching 4 including a 39�?� & 41�?� Muskie. 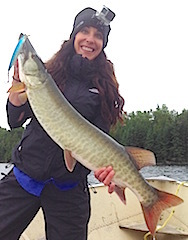 7th day was another BIG Musky day as they hooked 5 lost 2 big Muskie & Jennie again caught two, one at 40�?� & a huge 43�?� Muskie. 8th & final day they caught 16 Northern Pike & tried to soak up every minute before heading back to their busy lives in the city. They were sad to leave but very happy for the wonderful memories they made together in our fabulous wilderness setting. Todd Cambron & Reed Thacker from Indianola, IA were back for their 2nd year in a row. 1st day was the best they ever had fishing catching so many Northern Pike they could not even guess haw many so we just left it at that. 2nd day they had the best Big fish experience of their lives. Reed hooked a HUGE GIANT Muskie and after a long fight & three attempts at netting this monster it slipped out of the net leaving the hook behind. 3rd & final day they fished for Smallmouth Bass & Pike all day catching some quality fish including 6 over 18�?� Trophies plus well over 50 Northern. Both had a blast saying we would see them again. 3rd year return guest David Lilja from Woodbury, MN was back with Donald Heywood from Mound, MN for his 1st visit. By the end of the first day these two caught plenty of Pike & David also caught an 18�?� trophy Smallmouth Bass & a 36�?� Muskie. 2nd day they did it again catching over 30 Northern Pike. 3rd day was a day of catching both Smallmouth Bass & Pike saying that they caught their fair share. 4th & final day was another numbers day on Northern Pike catching well over 30 & Ed said they were all bigger Pike. Both had a great stay & departed telling other guests they would see them next year. 4th year return guests Ed & JoAnn Piotrowski from Hampshire, IL were back with Larry Starzec from Hainesville, Il for his 2nd visit. 1st day was hampered by a cold front & rain. 2nd day they caught over 20 Smallmouth Bass & 5 Northern Pike. 3rd day was great catching both Northern Pike & Smallmouth Bass with JoAnn cashing in on the BIG fish of the day landing a HUGE 19�?� Trophy Smallmouth. 4th day was a fabulous day Smallmouth Bass fishing as they caught 28 before supper several 17-17.5�?� an 18 & 18.5�?� & 19�?� plus two 30�?�+ Pike. 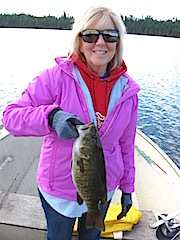 5th day was another fun Smallmouth day despite the wind & JoAnn caught another 18�?� Trophy. All left with Master Anglers Patches in hand having had a wonderful stay with us at Fireside Lodge. Bill Westbrook from New Philadelphia, OH was back for his 13th consecutive year with his wife Jill. 1st day they met post cold front conditions with cold rain a wind which made the Smallmouth fishing difficult catching only a few. 2nd day was great for Bill as he caught a 30�?� Tiger Musky, 6 Pike up to 35�?�, & 12 good size Smallmouth Bass including an 18�?� trophy. 3rd day was a �? ?GREAT�?� Smallmouth Bass catching day landing over 25 with 75% being over 16�?� & Jill caught 3 Trophies 18-18.5�?� with Bill catching 4 Trophy Bass between 18-19.5�?�. 4th day was windy & cool driving Jill in at noon after catching some Smallmouth Bass. 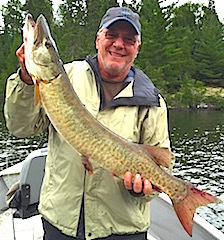 Then, while Bill was fishing alone he hooked into a nice 35�?� Muskie and had a interesting time landing it himself, taking the only picture possible, in the net. 5th & final day was a cool rainy day, Bill fishing most of it alone, catching another 18�?� Smallmouth Bass and a 34�?� Northern Pike were his highlights of the day. Both left with Big smiles on their faces having a wonderful stay & already discussing & planning for 2016. 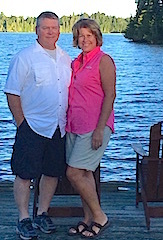 Bob & Carol Beaumel from Buda, TX returned for their 2nd visit with us at Fireside Lodge. 1st day Bob fishing alone caught 4 Pike & 8 SB up to 17�?�. 2nd day fishing by himself again he caught well over 20 Smallmouth plus caught the largest fish of his life a 41.5�?� Muskie. After a hard fight he managed to land this monster himself, releasing it without a picture but a long lasting memory. 3rd day was their best day ever catching 36 Northern Pike & 10 Smallies. 4th was a quality day, catching several Smallmouth Bass 16 to 17.5�?� & Carol caught a Trophy 18�?�er & also her 1st ever Musky at 31�?�. 5th day Bob braved it alone on a windy, rainy, cold day catching few fish. 6th & final day weather improved & Carol & Bob made a day of it having a 1st time adventure of breaking up a Beaver Dam. You could feel their excitement as they described their experience. They also caught 23 Northern Pike & Bob landed a trophy 18�?� Smallmouth Bass. Both said they had a wonderful time & talked about bringing Bob�? ?s younger brother next time. Jack catching an 18.5�?� while Bob caught two 1 at 19�?� and the other hitting the 20�?� mark. 3rd day was their best day ever with Bob & Johnnie alone catching over 60 fish mostly Pike, with Bob landing another Trophy Smallmouth as did Mike. As a group they caught over 160 Northern Pike. 4th & final day Bob & Mike caught over 70 Northern Pike while Jack & Johnny were right there with them catching slightly less, and Mike came up with a Trophy 18�?� Smallmouth Bass. 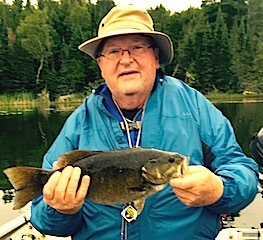 Jim & Paul did well on Smallmouth Bass with Jim also landing an 18�?� Trophy. All left saying they had a GREAT trip & are looking forward to their return. Long time repeat guest Brad Sammons from was back with his two sons. Day 1 & 2 they caught Smallmouth Bass along with Pike while searching for Mr Big. 3rd day was the jack pot as Ryne caught a fat 31�?� Tiger Muskie & brother Braden landed a HUGE Trophy 44�?� Tiger Muskie. They both took great pictures while sporting their newly purchased Fireside Lodge sweatshirts making themselves definite contenders for our 2016 brochure. The next two days they killed the Smallmouth Bass on Top-water Poppers catching Trophy Smallmouth, Ryne landing 3, Braden 4 & dad caught 2 ranging from 18 to 19.5�?�. That�? 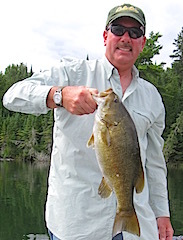 ?s great Smallmouth Bass fishing. 5th & final day the trifecta was in play as Braden would need a Trophy 40�?�+ Pike to accomplish what no other Fireside Lodge guest has done, catching a Master Anglers Award Trophy fish for Northern Pike, Muskie, & Smallmouth Bass in a single trip. Well it was not meant to be however they all went home catching trophy Smallmouth Bass along with many others in the 17-17.5�?� range and Brad finished the trip with a nice 36�?� Muskie having made a lifetime of memories with his boys. ended up with the fish of the day landing a monster 20�?� Trophy Smallmouth Bass. 3rd & final day of their short stay was a great day catching fish, spending some time at Twin Falls & enjoying the wonderful wilderness atmosphere one more time before heading home.